Which fats should you eat to lose weight? 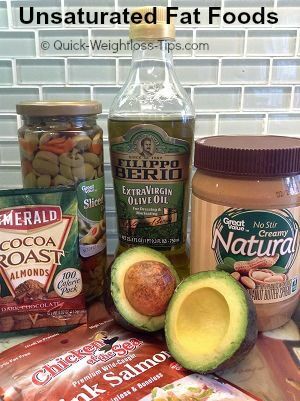 Unsaturated fat foods are the healthiest type of fat, highest in foods such as avocado, olive oil, and peanut butter. You might be surprised to learn unsaturated fat is also the best fat for weight loss, according to scientific research. As reported by Science Daily, researchers at Uppsala University in Sweden found unsaturated fat foods can lower body fat composition while increasing muscle mass. In comparision, saturated fats and trans fats are unhealthy, since they are linked to increased risk of heart disease. Trans fats are actually banned in some cities and countries. This study confirms eating saturated and trans fats also makes you fatter. Participants fed a diet of unhealthy saturated fat saw a "markedly greater increase" in liver and belly fat compared to those fed polyunsaturated fat foods. On the other hand, those fed healthy unsaturated fat foods experienced less body fat accumulation and had higher muscle mass by the end of the study. When choosing fat-containing foods, eat mainly those with a high percentage of unsaturated fat. This will give you the best chance to lose weight and preserve your health. Limit the total saturated fat you consume, and avoid trans fats. The list of foods high in unsaturated fat is brief. This list is a lot shorter than the foods with no carbs list! There are two varieties of unsaturated fat - monounsaturated and polyunsaturated. For best health and weight loss, include both types in your diet. Nuts such as almonds, hazelnuts, pecans, macadamia nuts, and cashews. Note: Palm oil and coconut oil are relatively high in saturated fat. 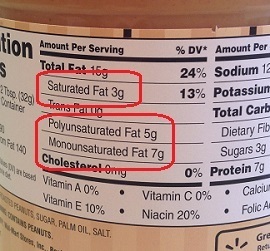 Different foods have varying percentages of saturated and unsaturated fat. None are 100% pure unsaturated fat. For example, the natural peanut butter in my pantry has 3g of unsaturated fat along with 12g of desirable unsaturated fat. The idea is to eat foods low in saturated fat but high in unsaturated fat. The foods listed above meet that criteria. But you still need to be careful about servings and calories. For instance, if you love peanut butter, don't go hog wild and overeat it, thinking excessive unsaturated fat is necessarily better. To lose weight, you have to remember the cardinal rule: burn more calories than you consume. Don't pile unsaturated fat onto your usual diet, or you'll end up gaining weight. Instead, replace foods high in saturated fat with unsaturated fat foods. Saturated fat is solid at room temperature. Examples include butter, the visible fat in meats, shortening, and regular ice cream. Lower the saturated fat you eat to 10% or less of your total calories. Some easy tips: whole milk is high in saturated fat, so switch to 2% milk instead. Choose leaner cuts of meat. And when cooking, replace shortening with olive oil or canola oil. Make salads to easily combine several foods high in unsaturated in one dish. To a bed of fresh spinach leaves, I'll often add salmon, olives, avocado slices, and peanuts. Then a bit of vinegar and olive oil for my dressing. That's 5 unsaturated fat foods in one simple, healthy dish. 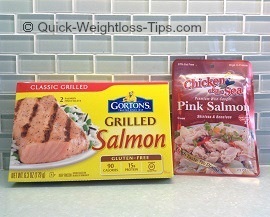 By the way, a really easy way to include salmon in your diet is Chicken of the Sea salmon packages or Gorton's microwave salmon. I sometimes grill my fish, but the prepackaged fish is much faster to prepare. Sprinkle a dash of lemon pepper seasoning on the microwave fish to improve the taste. Hopefully more studies will be done soon on the connection between unsaturated fat foods and weight loss. In the meantime, it appears the Swedish study has pointed us in the right direction.